Quality is what customers say it is. People working together hold the key to improving quality. We will be recognised as the pre-eminent organisation that promotes and supports the maximisation of world-class business processes and performance within New Zealand. We will promote and support the maximisation of capability in world-class business processes and performance for businesses and individuals alike. 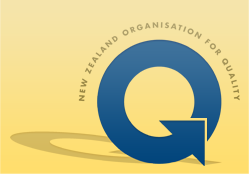 NZOQ is a non-profit, professional society dedicated to providing leadership in the adoption of the principles of quality management and best practice in New Zealand. Quality is vital to New Zealand organisations and individuals if they are to succeed in the increasingly competitive marketplace. Since 1977, we have provided leadership in the advancement of quality management and best business practices. We are a non-profit volunteer organisation that promotes and supports ethical and sustainable practices and diversity. We demonstrate leadership in improved business process through advocacy, education, promotion and support. We also promote and represent high standards of professionalism through the provision of opportunities for learning and growth. NZOQ's strength is the diversity of our members whose skills and experience span the spectrum of New Zealand industry sectors. We support our members through networking, information sharing and training initiatives.